Throughout 2018, nearly 50 million Americans hit the water for a day of fish-catching fun, excitement and relaxation with family and friends*. Odds are one of those outdoors enthusiasts will land on your holiday shopping list this winter. Luckily, there’s no need to stress. 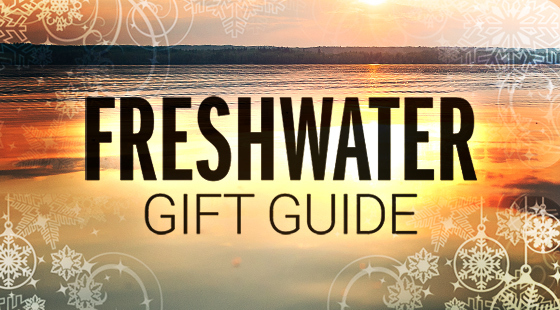 Make your holiday shopping quick and easy with sure-fire gifts from Rapala® and Respected Rapala® Brands. From the world’s favorite lures to must-have accessories and quality apparel for on and off the water, check out the latest and greatest from the most trusted name in fishing for plenty of gift-giving inspiration this year. The Rapala RipStop is a fast-ripping, hard-stopping fish-catching machine. It’s also this year’s perfect stocking-stuffer. This summer, the experts at Rapala introduced a larger RipStop to complement the original size 09 model, providing bass-obsessed anglers with a larger option to help them catch even bigger fish. The size 12 RipStop features all the design elements that made the lure an instant classic, but with a longer profile, more weight for longer casting and a third VMC® hook that will increase the odds that each bite ends with a fish in your favorite angler’s net. The secret to the RipStop’s success is its one-of-a-kind boot tail, which creates a hard-rolling, slashing action that mimics live minnow movements and causes the bait to stop on a dime when paused. As the RipStop’s body shimmies as it comes to rest, it will slowly rise, signaling an easy meal for predators. The bait can be fished as a twitch bait or popped and ripped like a jerkbait. It works equally well when retrieved at a steady pace. 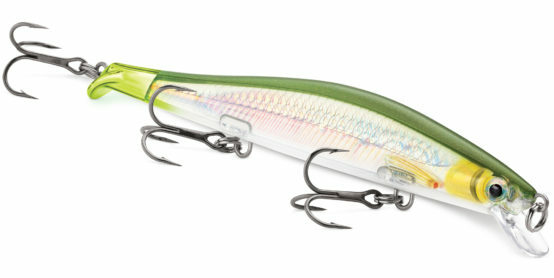 The new size 12 Rapala RipStop swims between 4 to 5 feet, measures 4-3/4 inches long and weighs 1/2 ounces. It’s available in 14 appetizing color patterns to match the hatch in local waters across the country. For years diehard anglers have hoped for the perfect multiuse fishing line, one that is sensitive enough to detect subtle bites, yet strong enough to reel in mammoth trophy fish. Enter new Sufix Advance™ Monofilament: the first mono that thinks it’s a braid. A versatile gift for the anglers on your shopping list, Sufix Advance Mono is well-suited for targeting multiple species in nearly any scenario — from big bass to wiley walleye and aggressive pike. Breaking new ground in the category, Sufix Advanced Monofilament is made up of fiber molecules traditionally found in braided line. This unique composition is achieved through Sufix’s proprietary magnetic extrusion process, which blends fiber molecules to form the strongest bond seen to date in monofilament line. The end result is an innovative product that delivers on durability without sacrificing the line’s suppleness and excellent handling characteristics. 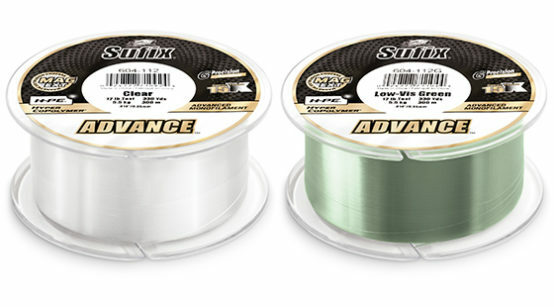 Offering anglers 50 percent lower stretch and UV absorption than standard monofilament, Sufix Advance Monofilament offers smooth, extra-long casting and unbeatable knot strength, upping anglers’ chances of hauling in a trophy catch. Available in clear and low-vis green, the line is available tests between 4-25 pounds in spools up to 330 yards. Just in time for your holiday shopping spree, Rapala® has introduced a collection of eye-catching new logo caps sure to fit any angler’s style. 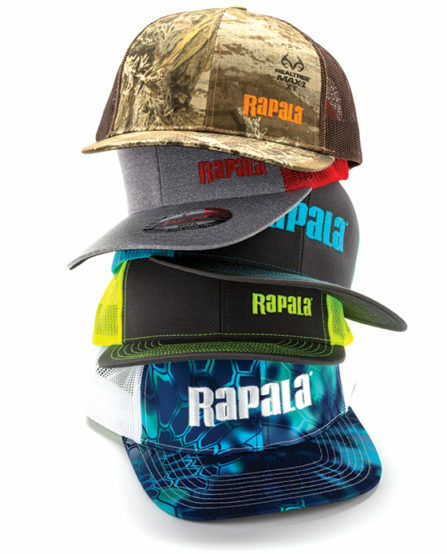 Whether on the water or busy about town, Rapala’s new Patterned Snapback Trucker Caps are a can’t-miss gift for the modern angler. Each cap is embroidered with the iconic Rapala logo over one of four camouflage designs — RealTree Max, Kryptek Neptune, Kryptek Pontus and Kryptek Black — intended to match favorite outdoor environments, from the shimmer of clear blue waters to the earthy tones of the deep woods. Each cap’s adjustable plastic snapback closure ensures a snug, comfortable fit. While these dynamic new caps are the perfect accessory to round out any angler’s wardrobe, it doesn’t stop there. Visit Rapala.com to browse a wide range of premium apparel, including t-shirts, long-sleeve shirts, hoodies and more. Designed to meet Rapala’s unparalleled quality standards, a new piece of apparel is the ideal gift to ensure your friends and family look good as they reel in their next big catch. For jobs big and small, the right tools make tasks easier, especially on the water. Before they hit their favorite honey hole next season, make sure the angler in your life is equipped with the latest tools and accessories from Rapala®. 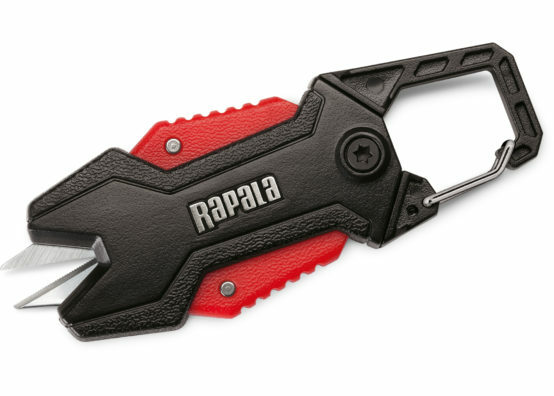 Add convenience to your loved one’s angling arsenal this year with the new Rapala Retractable Line Scissors. Featuring super-sharp blades, this handy tool can cut small braid and nylon fishing line with ease. Simply slide the line into the tool’s handy “V” cavity and squeeze its ergonomic red handles. The tool’s unique design makes it easy to cut line, even in choppy waters. 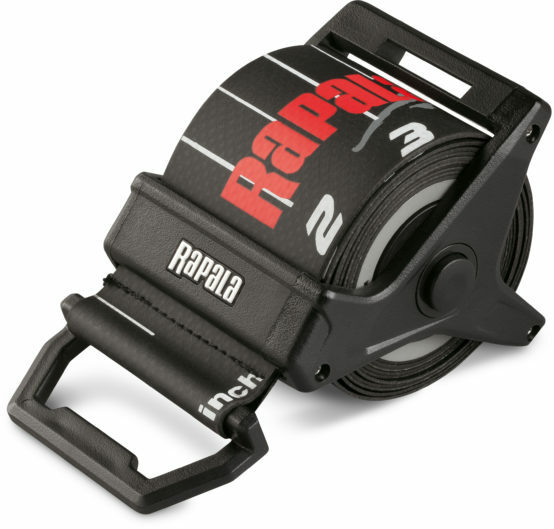 Another helpful tool for their boat is the new Rapala 60-inch Retractable Ruler. Spring-loaded for added utility, the ruler features oversized, easy-to-read numbers in 1/2-inch increments and a nonreflective surface that will ensure your pal’s fish’s length shows in photos. Made from a long-lasting, UV-protected waterproof material, it includes a flip-up nose board for accurate measuring. Once the fish is caught and measured, the angler on your list will need a quality fillet knife as they prepare their catch for a delicious shore lunch. Look no further than the new Rapala 5-inch Folding Fish Pro Fillet Knife. The perfect size for traveling light, this patent-pending fillet knife folds to a compact size for easy storage. When folded, it measures only 6-1/4 inches long. An easy-release, lock-back design makes it a breeze to open and close. 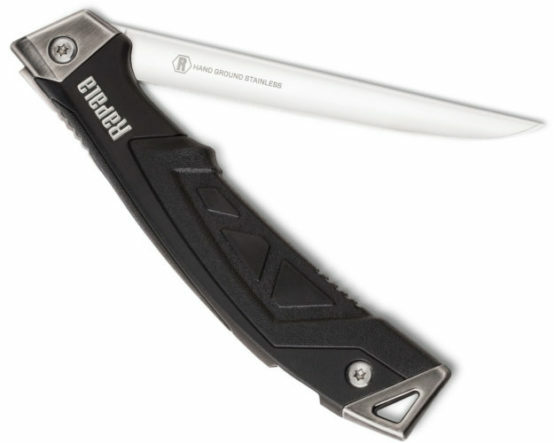 Featuring a comfortable ergonomic handle, its razor-sharp blade is made from hand-ground Japanese steel. With a progressive-taper flexible blade for optimum control, it provides perfect balance, a comfortable grip and a super-sharp edge. For a show-stopping gift, wow a lucky outdoors junky with a new electric Rapala fillet knife. Built to handle the toughest fillet chores imaginable, an electric fillet is an essential tool for serious anglers. Choose from an electric fillet combo for an option with multiple blade sizes and added versatility or a cordless model like the Rapala Lithium Ion Cordless Fillet Knife to give them a bit of room to roam as they prep their next big catch. Your friends and family will love the comfort, durability and speed that comes with each Rapala electric fillet knife. While a new electric fillet knife is perfect for fish camp, the angler who also loves to cook will be blown away when they unwrap a brand-new set of Marttiini kitchen knives this holiday season. These sharp, high-quality kitchen knives are the essential tools for any cook. Made by the artisan blade manufacturer Marttiini, the makers of premium Rapala® fillet knives for more than 50 years, these knives are crafted with care and expertise. Cut bread, meat, fish and vegetables like a pro chef with these proper tools. Available exclusively on Rapala.com in a wide variety of styles, it’s easy to fill any need your favorite angler-turned gourmand has in the kitchen with the Marttiini Carving Knife and Marttiini Gourmet Steak Knives. To go all-out this holiday, head online to order the Marttiini Knife Block, complete with five essential varieties: peeling, vegetable, filleting, bread and cook’s knives. 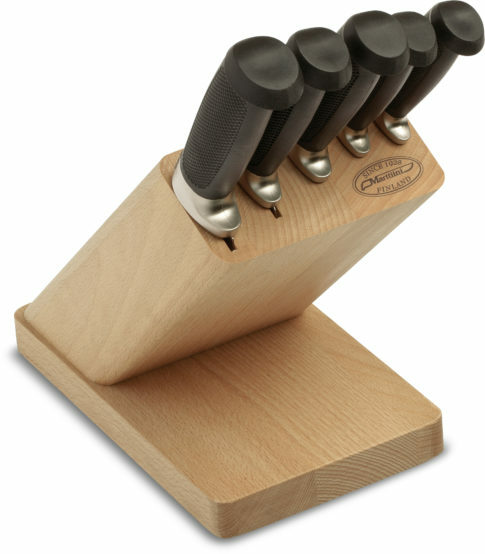 The set comes with a beautiful block of white beech wood to ensure the knives are always within easy reach and remain sharp and in good condition longer. Who knows? Next year, your thoughtful gift may be repaid with a holiday feast prepped with care and the help of quality Marttiini Kitchen Knife. This entry was posted in News, Rapala. Bookmark the permalink.